D2 will be as unpredictable as always with many teams with legit chances to contend within the top 8. However, this year, more than past years, I don’t see a super low seed being able to run off enough wins to win the whole thing like Hand did last year or Fairfield two years ago. Let’s take a look at our eight D2 matchups. To see my full D2 Predicted Bracket click here! Conard was able to hold down the #1 overall seed with a win over D1’s South Windsor to end their season a day after losing badly to SGWL. They host 16 seed BCR at 7:00 at Veterans. The Chieftains lean heavily on some top flight top line talent. Junior Jordon Fongemie, sophomore Zach Polo and junior Mark Ehnot have lit up scoresheets all year. This offensive potency should be too much to handle for BCR who’s been known to allow a fair amount of goals. Conard can make a run this year but even as a #1 seed will have a ton of trouble with the traditional SCC powers and SGWL. BCR fell to Conard 7-0 the only time the two teams met this year and went 0-7 against D2 tournament teams. This one could get ugly early if BCR doesn’t come with their absolute best. In an epic 8/9 matchup North Haven hosts Cheshire at 4:00 at the NIP. These two teams met earlier this year with the Rams picking up a 5-2 win. North Haven sports one of the state’s best goalies in senior Andrew Graziano as well as senior forward Tyler Luedee whose play has really elevated of late. The late season move of putting Cam Owens on forward instead of D has also proved worthwhile for the Indians as well. Cheshire is a tough team to read. They broke a 5 game winless streak beating D1’s West Haven last time out but only finished the regular season 3-8-1 over their last 12. One of those wins, however, was against North Haven. This one will come down to whether or not Graziano can keep Cheshire’s top line threats like Matt Jordan and Ben Klanica off the board. This is easily one of the best games of the day and should be played in front of a packed NIP. In the night cap at the NIP #4 North Branford hosts #13 Wilton. NB, like Cheshire, is tough to read. They boast plenty of talented skaters fronted by senior Alec Martone and junior Adam Burkle. They have one of D2’s better goalies in sophmore Will McEwan but the T-Birds have underperformed at times, most recently losing to New Milford in the SCC/SWC D2 semis and earlier this year losing to East Haven. That said, I have them winning this game but it could be closer than most would predict. Wilton counters with a talented, under the radar leader in senior Kyle Jonas. He’s worth the price of admission alone. The Warriors also will need seniors Ned Zawislak and Jameson Hill to provide secondary options if the T-Birds are able to isolate Jonas. North Branford should be deep enough to notch the win. I do think this one will be close, however. A lot of unfamiliarity with this one as well as these two teams didn’t meet this regular season. Newington-Berlin, the 5 seed, hosts Guilford, the 12, at 4:20 in Newington. This has the makings of a classic trap 5/12 game. Newington-Berlin is the more talented team, there’s no doubt. The DiPaola brothers, senior Marco and junior Luca are ridiculously fun to watch. Senior captain Dante Gugliotti is also a player who could take over a game on any given night and their top D pair of senior Mitch Pitkin and junior Aaron Lassen are hard to replicate. That said, Guilford, a battle tested SCC squad has what it takes to pull the upset here. I didn’t predict this but I wouldn’t bat an eye if it were to happen. Senior Ryan Brand is a talented kid and leads a cast of capable scorers who if they play as one unit could surprise some. Guilford is also coming in playing some of their best hockey of the year going 3-1-1 to round out their regular season. Newington-Berlin is coming off back to back losses, an OT loss to the Bucks on senior night and a semifinal loss to Fermi in the CCC South tourney. This one will be tight, but I think Newington-Berlin has enough horses to keep them a nose ahead. 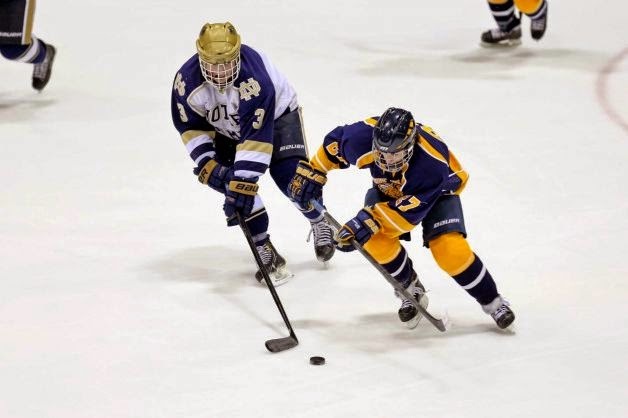 EH's Pete Capone battling vs. NDF last season. Suffield-Granby-Windsor Locks opens tournament play as the 2 seed hosting 15 seeded East Haven. The Yellow Jackets come in fairly hot. They’ve won 4 of 6 and beat D2 Top 10 mainstay New Milford on the final game of the season to earn a bid. SGWL won 10 of their final 11 regular season games with the only loss coming to D1’s Northwest Catholic. East Haven’s sophomore Pete Capone has put together a nice season and has lead the Yellow Jackets when they desperately needed someone to take over. Fellow sophomore Joe Aloi and junior Anthony Avallone (15 points in 10 games) also have what it takes to be impact players. That’s all well and good but it may not be enough to contend with the fire power that the Wildcats possess. SGWL has 7 players in double digits scoring this year and it’s been well documented how talented senior Jake King is but underclassmen like Brendan Looney, Colin MacDougald, Austin Rupp and Jake Bourdeau cause matchup problems all over the ice. You can’t key one line when a team can cycle more than one top line. Pair with that the stalwart presence that is senior goalie Shane Kertanis and the Easties better be strapped up ready to go. I think East Haven can actually keep this one close if they play like they’ve been, but if they fall behind early it could get ugly. #7 New Milford hosts #10 Fermi-Enfield at 7:30 at Canterbury. I picked the Wave, but the way Fermi is playing right now part of me wants to go back and change it. Fermi is coming off a CCC South title, notching wins over Newington-Berlin and EO Smith-Tolland. New Milford is coming off a SCC/SWC D2 title loss to Branford. The Wave boast top tier talent but their depth could be an issue. This was clear in their loss to Branford. Seniors Tommy Nisco, Logan Doud and junior Riley Zimmerman all have the ability to thrill. Junior goalie Alex Fortuna had an uncharacteristic day allowing 5 against Branford. He’s a much better goalie than that. The thing that scares me about New Milford are the way inferior teams have been able to beat them. This has happened a few times, East Haven, BBD, Wilton. Fermi, in my opinion, is certainly stronger than those teams, so if New Milford comes with that lackluster level of intensity the 10 seed has a legit shot. However, it’s a state tournament game, if they aren’t pumped up for that, they may never be. Fermi’s Brian Riley is one of the state’s best players bar none. 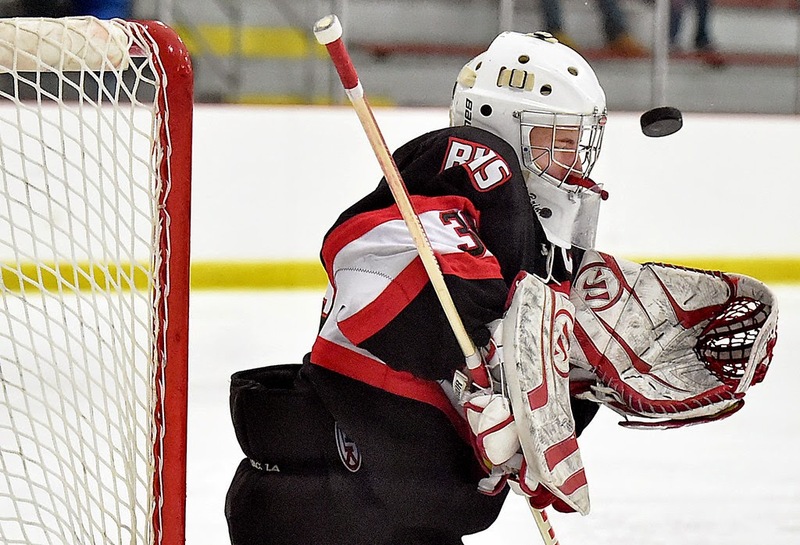 Senior Ryan Gothers and junior Matt Votta also provide some scoring depth for the co-op and goalie Sam Roy is one of the state’s hidden goaltending gems. This one is a toss up, no questioning that. I’ll stick with my original pick, very hesitantly. Senior captain Brink's last chance at greatness. #3 Branford hosts #14 Daniel Hand in the second game at the NIP around 6:00. This rivalry game is a fun first round matchup and pits the defending D2 champ against my predicted D2 champ. Branford looked scary good in the SCC/SWC D2 Championship against New Milford and senior goalie AJ Brink is playing as well as he has his whole career. Senior Tyler Criscuolo is an unreal talent and as disliked as he is by many in the state his on ice exploits are unmatched. Gritty, mean, Thin Minty hands, the kid’s talented. But he’s not alone. Senior Cooper Bunton has had a nice little year for himself as has sophomore Zach Withington. Branford’s D core is what separates them from the rest though. Seniors Pat Cunningham and Jack Murray are as solid as they come. Hand, all things considered, has done well for themselves getting to this point. They lost a ton last year after their championship but have a group lead by sophomore Matt Rice and juniors Reed Berestecky, Luke Brown and Jeff Rider that have allowed them to have success in smaller doses than last year. In the end, Branford should be too much to handle for the Tigers who will put up a fight. But it likely won’t be enough. On February 21st, Fairfield and Milford met with the Mustangs walking away with a 1-0 win. Now the 6th seeded Mustangs host the 11th seeded Indians at the Wonderland at 7:00. Fairfield boasts 50 point scorer junior Jake Fuss as well as 45 point scorer senior Trevor Demilt. Senior Zach Weinstein anchors a defensive unit that has been solid all year. The Mustangs have that weird feel about them this year. They’ve gone relatively under the radar and could make serious noise if they can get past Branford in the second round. They have to get past Milford here in the first in order to do that and that will be no easy task. Sal Follo’s boys have shown all year they can compete. This was no more evident than in their regular season finale, a 2-2 tie against North Haven. Senior Sean Rowland has played all year for the Indians in goal and will be relied heavily upon in this one. Jon DePascale and David McLenithan hold down an equally as strong D core while Brady Dennigan and Brandon Argyros will be needed to kickstart the Indians’ offense. I think Fairfield is the better team will potentially more dangerous talent but this could easily be a one goal game or possibly an overtime affair at the Wonderland. BEST GAME: (9) Cheshire @ (8) North Haven- A great SCC battle to start off the D2 tourney at 4:00. Two teams that could go far if they get past this initial test. Couldn’t be more even. BIGGEST BLOW OUT POTENTIAL- (16) BCR @ (1) Conard- BCR lets up a lot of goals. Conard scores a lot of goals. Not sure BCR can stifle Fongemie, Ehnot and Polo. BEST PLAYER MATCHUP- Alec Martone (North Branford) vs. Kyle Jonas (Wilton) Fairfield County doesn’t know much about Martone and New Haven County doesn’t know much about Jonas. After Tuesday, they probably will. Two elite talents clash. UPSET ALERT- (10) Fermi-Enfield @ (7) New Milford- Not many teams in the state are playing as hot as Fermi. New Milford has had slip ups this year. Sets them up for one here possibly.